Dish washer, for handling the excessive number of tools needed for this dish. Start by cutting up the cauliflower into small pieces. Put them into one of the heatproof mixing bowls, add the water, then cover with a plate and microwave for 4-6 minutes. You want it to be cooked, but not mushy. I normally use plain ol’ white cauliflower for this dish. 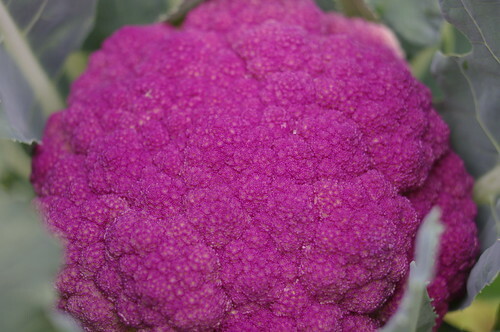 The purple one was so pretty when it was simply steamed that I kind of didn’t want to rice it. 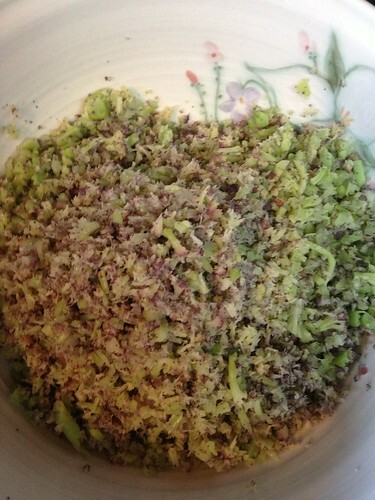 Next, put the cauliflower into the food processor in batches, and grind it down to approximately rice-sized pieces. 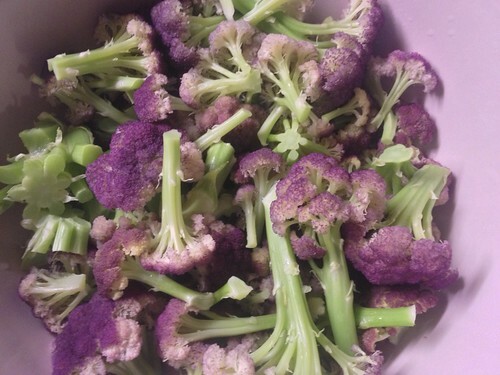 This one didn’t quite work right–either because the cauliflower was in the process of flowering, or because I cooked it a little too long in the microwave. Still, it was small–maybe orzo sized. That works if that’s what you get. Use your rubber spatula to clean the cauliflower out into the other heatproof bowl as you go along. It doesn’t look so great once it’s all ground up (urgh). 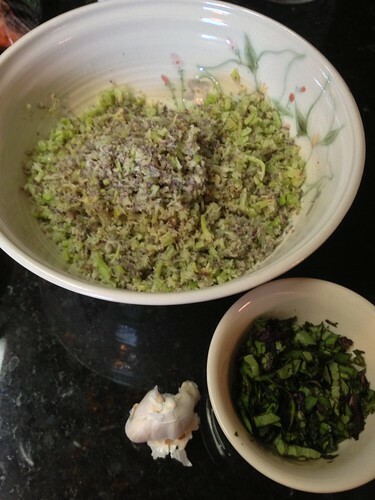 If you’re using fresh aromatics, peel the garlic and mince the basil. (The basil below wasn’t finished being sliced up. You want it minced.) If you don’t have a garlic press, you can mince the garlic too. Or go buy one at Ikea for $4–it’s a good investment. If you’re using the Trader Joe’s cubed herbs, get those suckers out of your freezer. The major ingredients for this dish. Not shown: oil, salt, and pepper. 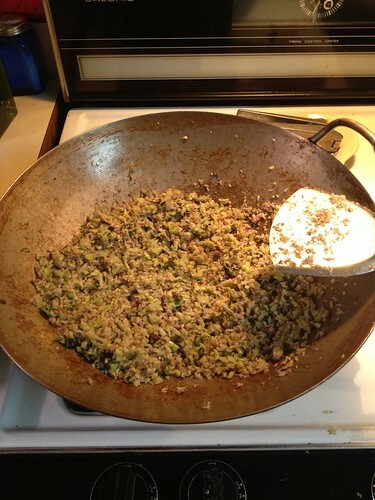 Turn the heat on under your wok, and allow it to get hot before adding the oil. Tilt the pan in circles to allow the oil to coat it, then either (a) squeeze the garlic into the hot oil, then add the basil and cauliflower, or (b) throw in your frozen cubed herbs, allow them to melt slightly, and then put in the cauliflower. Add salt and pepper to taste. Stir fry for a few minutes, until parts become golden brown, and/or the overall scent is pleasing to the nose. Turn off heat, and plate. Serves 3-5, depending on the size of your cauliflower head, and the appetites of those eating. Author’s note: I’m backdating the post to the day it’s covering.